After the frustration that some of us (me included) may have felt during last week's episode of Ballers, given the tonal imbalance, some things needed to happen this week to make up for it. They both did and they didn't. While things continue to be very splintered, other interesting threads are being pulled, yet the genuine drama continues to be interrupted by groan worthy comedic scenes that are seemingly shoehorned in for reasons I can't fully understand. Let's dig into last night's episode Saturdaze, shall we? To kick things off, we get to see Spencer (Dwayne Johnson) and Jason (Troy Garity) getting drunk at a bar, which seems to be keeping with the theme of casual substance abuse that we don't really talk about by most of the characters in the show. Except, oddly, for Ricky (John David Washington), but more on that later. The pair, seemingly out of obligation, reference the fact that Spencer's girlfriend (who never shows up in the show anymore) Tracy (Arielle Kebbel) is taking that job with ESPN. So, Jason gives Spencer some flack about not being able to make a long-distance relationship work. Spencer then takes a similar jab at Jason. That's the end of that. The pair instead decided to focus on Travis (Adam Alderks), who isn't exactly very high on everyone's draft list. Most importantly, Mark Schlereth. So, they decide to go fishing. That makes sense, right? On the most removed, yet somehow kind of most likable side of things, we caught up with Charles (Omar Benson Miller), who is adjusting to his new office job with the Dolphins. Sadly, the nicest man on the planet doesn't get to spend a lot of time adjusting, because Charles has to inform a player that he is being cut, because of a suggestion he made. Needless to say, Charles didn't handle it very well, because he couldn't find the guts to deliver the bad news. He stuck the landing pretty well though, I think we can all agree. The thing to take away here is that Charles is insanely likable, his story is maybe the most interesting thing Ballers has going for it right now, but it is very much just a small part of the pie. It would be nice if his storyline, and for that matter everyone's storyline, could sort of weave together a bit more than they are right now. Oh well. We still love you Charles. Joe (Rob Corddry) got to spend some time away from Spencer in this episode, which was interesting, as he decided to attend a party with a lady friend of his. It just so happened that the party was at Andre's (Andy Garcia) house. Would you believe that Andre planned it that way? Of course you would! Because he is the quiet, evil genius bad guy that this show kind of doesn't really need, but we kind of still like. Being the evil genius that he is, Andre decided to offer Joe a job in order to totally burn Spencer. But as Joe put it, he wants to be more loyal than successful, and that was kind of a nice moment as well. It is a little frustrating that an actor as great as Andy Garcia is being so under-used up to this point, but hopefully that will chance. Hopefully. Now, onto what I would consider to be the biggest conundrum facing Ballers at the moment. Ricky. Remember last season when Ricky was a total mess and that was one of the main things that made the show super watchable and compelling? It has become very clear that since RIcky got his act together, his "conflicts" are very, very boring. Do we really care if he goes to Buffalo or New Orleans at this point? However, the one super compelling conflict involves his dad, who just so happened to show back up out of nowhere and totally ruin things for Ricky this week. By tweeting out that Buffalo had a better offer out to Ricky, his dad forced New Orleans to take their deal off the table. Cue the genuinely dramatic, gripping, crazy, father/son fist fight in the kitchen! That is, until the scene was interrupted by one of Ricky's friends who cracked a totally out-of-nowhere joke that wrecked the moment. Why? Please. These things need to stop. 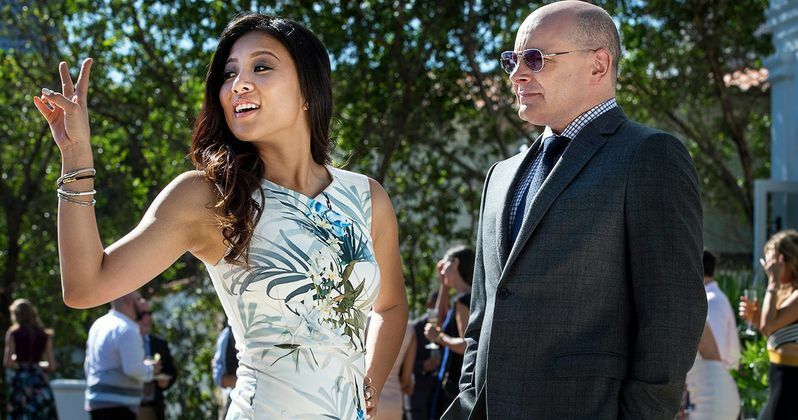 Not that Ballers was ever an overly serious drama, but the one-liner comedy has no place in those moments. In the end, Spencer and Jason did manage to get Mark to come around on Travis, after he ran really fast on a beach. So yeah, fishing worked out for them. Elsewhere, Vernon is apparently still nursing his leg, because he wasn't in this episode, and everyone is sort of doing their own thing and it is all connected by the fact that it all has to do with football. Kind of. Let's just hope that the more interesting story-lines, like Spencer's post-football issues and denial and Ricky's problems with his father, are brought more to the forefront. And please, no more silly, needless, shoehorned humor. We shall see how The Rock and everyone else decide to handle it when Ballers returns to HBO next week at 10 p.m. EST.